OK, so I know I am way behind on this entry. Yes, it's already almost a week past New Years but I have my reasons. Been a bit jet lagged and also have been working late. Excuses aside, that's sooooo 2009. Reflecting on the past year, it's truly been a culinary feast. This was the year that I went crazy for tasting menus. You know, those five to nine course dinners, sometimes with wine pairing. As a result, I've probably packed on a couple pounds but the memories I've captured were priceless. While everyone is reflecting on all the events in the past year, I too shall do so and reminisce about my favorites of the year. Most people will have The Bazaar on their top list. After all, dining there is not only an amazing and unique food experience but the setting is visually captivating. You'll be impressed not only by the quality, preparation, textures and presentation of the food, but also with the Alice in Wonderland feel of the hotel itself. Unfortunately this was PBD (i.e. pre blog days) so I don't have an amazing writeup to link to, but I do have some memorable photos. 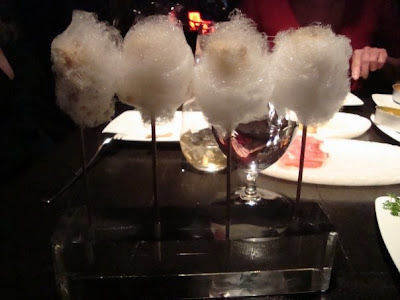 Foie lollipops, a cube of foie gras coated with crunch and wrapped with cotton candy/fairy floss. This was the perfect bite of rich foie, coated with corn chips for that little crunch, and finally that sweet floss that dissolved upon touching your tongue. This was probably the first time that I realized the beauty of contrasting textures in a single bite. You see the trend here? I'm a foie lover. The sliders were heavenly. 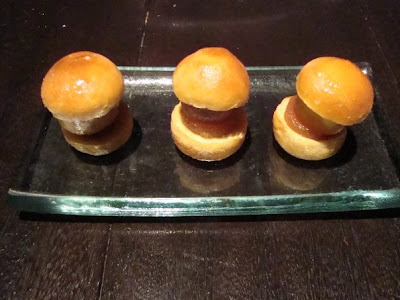 I had rarely seen foie sliders before Bazaar and I don't understand why it's not more common on menus. It's a perfect conception. Rich but tiny portion of foie on a bun is parallel to a charcuterie plate of a piece of foie and toast. Kobe beef atop an airy bread injected with cheddar cheese. Smart and upscale interpretation of the original. I much prefer this version of course! I also enjoyed the paella on another visit. It wasn't paella as you know it; it was fideua or rossejat which is made with noodles instead of rice. The fideua was excellent as it was rich with seafood essence yet lacked the starchiness (in a good way) of a rice-based paella. Really one of the best meals I've had. The place that inspired my search for pigs ear. Church and State's version was top notch. Crispy pieces filled with soft and gooey rendered cartilage. Pied de Cochon comprised of pork cheek, shoulder and feet, breaded then fried was also a winner of the night. That fig tart was delicious as well and is something that I still think about often. Everything from the food to the service was impeccable. Think it was also memorable because all the chefs came by to our table to chat with us. If you had told me I would be eating a four course seafood meal, I'd cringe at the thought of a meal comprised mainly of fish. But Le Bernardin showed me that fish doesn't have to mean salmon (yuck) or halibut. 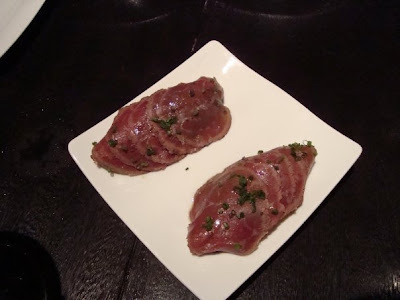 It can be lightly marinated fluke, or tuna wrapped over foie gras en croute. And all the ingredients in the langoustine dish worked harmoniously. Finally, a restaurant that serves uni risotto wins high marks. One of the most filling and longest meals I've had, the Menu Plasir at Ortolan was 11 courses not including amuse bouche, palate cleanser and petit fours. The duck laque was my favorite as it was perfectly cooked with a crispy, caramelized skin. I would say that dinner at Ortolan was definitely one of the most decadent and luxurious meals I've had to date. 2009 also marked the year of trying new things and there were some obvious trends. The following are some of my high points of 2009. It's a recession, kids! We all can't afford to drop the benjamins for a five course meal at a Michelin starred restaurant. During 2009, I've experienced more home cooking and dinner parties. I'm growing up after all. Parties no longer mean burgers and a keg. I was nervous initially to host an actual sit down dinner party but have found that it's actually a lot of fun and will prepare you for those lavish dinner parties you'll have to throw when you're married to that dashing attorney and have to entertain his equally dashing and witty colleagues. Our first home cooking trial started off with a Spanish tapas dinner where everyone pitched in to cook dishes on site such as paella, bacon wrapped dates with almonds and Spanish tortilla. Next, my friend LB bravely took on the feat of cooking us a Jose Andres inspired Spanish dinner which included sauteed squid, scrumptious rossejat and refreshing sangria. Finally we pushed our fears aside to prepare a five course Singaporean feast, utilizing many recipes that we had learnt at a cooking class at Rocksugar restaurant. It's popping up everywhere at restaurants. In fact, it's becoming more acceptable that I now don't have to blush when I'm purchasing chicken hearts and gizzards at my neighborhood Ralph's. I still don't like the fact that restaurants charge such a premium for their offal dishes when it used to be their scraps. But kudos to them for being able to capitalize on that. Pigs Ear at Church and State: I would say affirmatively this was actually the best dish I had in 2009. How do I know it's the best? Because I still dream about it. And every time I ordered pigs ear at another restaurant, it could never compare to that at Church and State. Pigs Snout at Le Bistro Paul Bert: The only other dish I've eaten that reminded me of Church and State's pigs ear because it was soft and gelatinous in the center and crispy on the outside. Sweetbreads at Animal: Perfectly executed, served with mushrooms and paired well with capers and Myer lemon slices. Sweetbreads at Fleur de Lys: Breaded perfectly and silky in the inside, served with poached egg and leeks. Sam Woo: Where you can buy intestines and stomach for a nominal fee. The best part is you can take it to-go and eat it in the privacy of your own home, without friends glaring at and judging you. Soups have never interest me. It's usually the typical minestrone or vegetable soup. But thankfully, it's Winter season and with that comes the arrival of homey, comforting soups made with Fall/Winter seasonal products such as squash and pumpkin. Pumpkin soup at Bashan: I hadn't had much of hearty soups all year and Bashan was the 1st in 2009 that left an impression because it was so satisfying. It was also our second amuse bouche which was such a pleasant surprise. Tahitian Squash Soup at Sona: The eel at the bottom of the dish was delicious and added saltiness to the soup. Poisson Soup at Chez Michel: The fact that they left that jug of additional broth on the table was a plus. Fish pieces at the bottom of the plate was flooded with flavorful fish broth. These days, everyone seems to have a slider dish on their menu. Personally, I like it. I'm all about sampling small dishes and prefer not to commit to a giant burger. Besides, these little things are so adorably compact, how can you not like them? The best ones are served on homemade brioche buns (that really makes a BIG difference) and is usually sandwiching a nice petite patty or something yummier like pork belly. Pork Belly sliders at Animal: Brioche bun with fatty juicy BIG hunk of pork belly. Creamy slaw was a nice addition. Gyenari: You get a choice from 3 types of sliders which is a nice selection, and sometimes it's refreshing to have flavorful Korean BBQ marinated bulgogi in your sliders instead of those all-American patties. Pulled Pork Sliders at The Yard: Juicy and sauced up pork on brioche bun, and $6 for a trio during Happy Hour. Yes I said it earlier, I'm all about the little bites. It's not because I am a grazer (because I'm NOT), but rather I'm a bit of a greedy pig and want a taste of everything. However there are times when the wallet and scale prefer a less expensive and filling meal. Those are the days when I head over to my favorite watering holes to grab a light dinner and drinks. Viceroy: For now, they have happy hour from 5-9pm (no need to drive like a maniac to catch last call!) and all night on Thursdays. The shrimp tempura and sliders were good. Free popcorn ended the night on a sweet note. Bar food: The steak and kidney pie with that lovely buttery, flaky crust was amazing. Love their Thai Bangers & Mash as well. The sausage has Thai spices and is so much more interesting than your regular wiener. They have Happy Hour all night now so take advantage! I know I will. Gyenari: Happy hour ends at 8pm, $3 wine, $3-5 food that doesn't include crappy wings and potato skins. Need I say more?